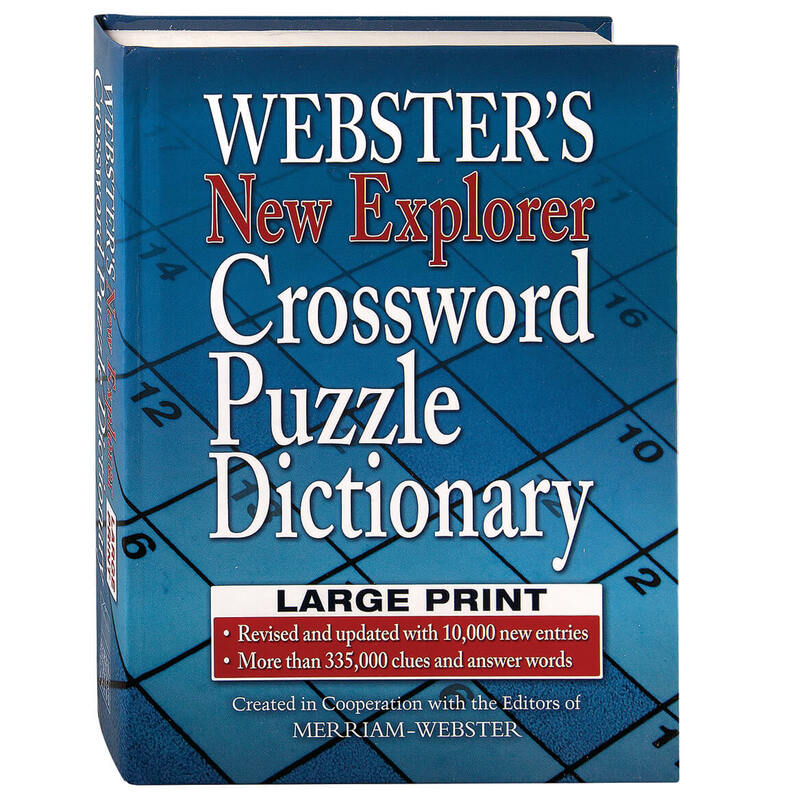 Webster’s new explorer crossword puzzle dictionary is revised and updated for today’s modern puzzle lovers! This crossword puzzle dictionary, Webster’s comprehensive third edition, offers 350,000 answer words to help you conquer any crossword! Includes 75,000 new entries and complete coverage of words, people and place-names in current headlines. Hardcover, 818 pages. 8 3/4″ long x 5 3/4″ wide. 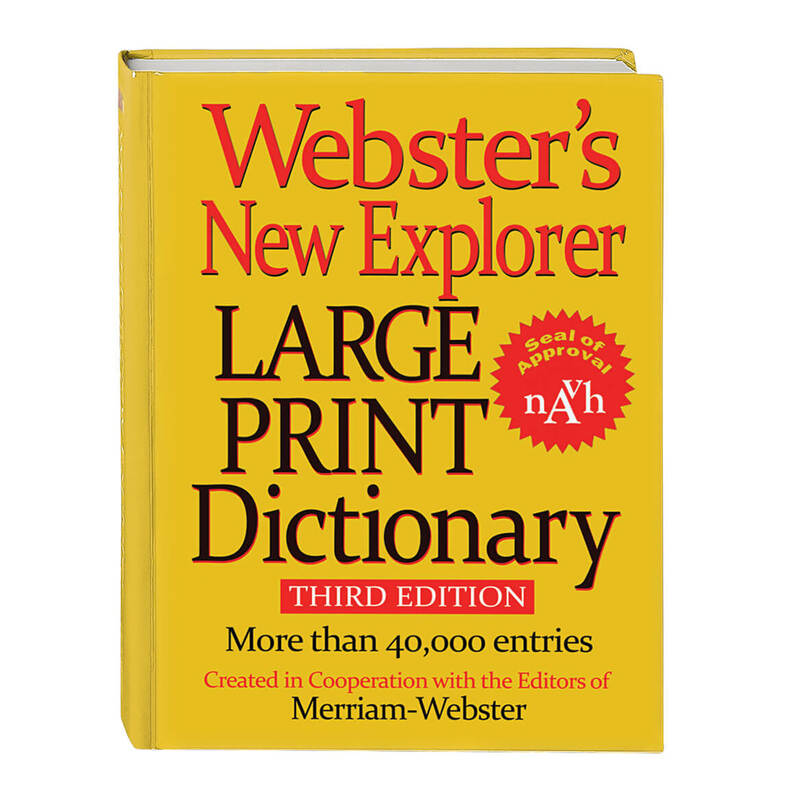 With clear, oversized print that’s easy on the eyes, this up-to-date Webster’s® large print dictionary boasts more than 40,000 entries you can read without straining! A reference essential for any home, this large print dictionary includes updated words for everyday use, crossword puzzles and word games. Hardcover; 753 pages. 9 1/2″ long x 7 1/2″ wide. Large enough for tablets, iPads, e-readers, books and magazines, this easel-shaped wedge book pillow rests comfortably on your lap … making it perfect for reading in bed! Going wherever you do, the reading pillow is light and easy to hold, great for car trips and a thoughtful gift for any avid reader or tablet user. Faux suede, 100% Dacron cover removes for machine washing (air dry). 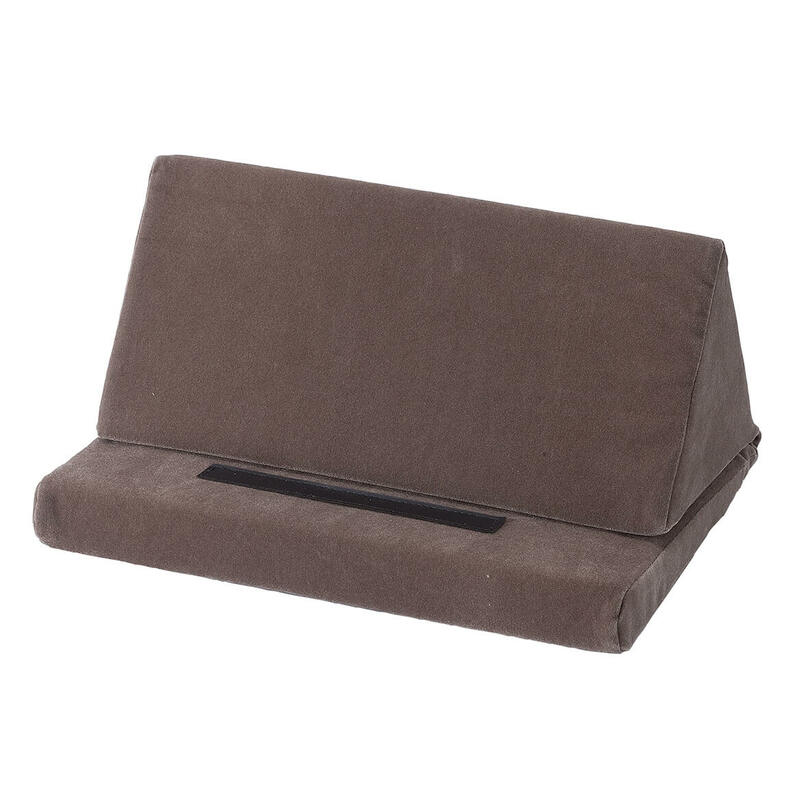 Wedge pillow features foam filling. 9″ long x 13″ wide x 6″ high. 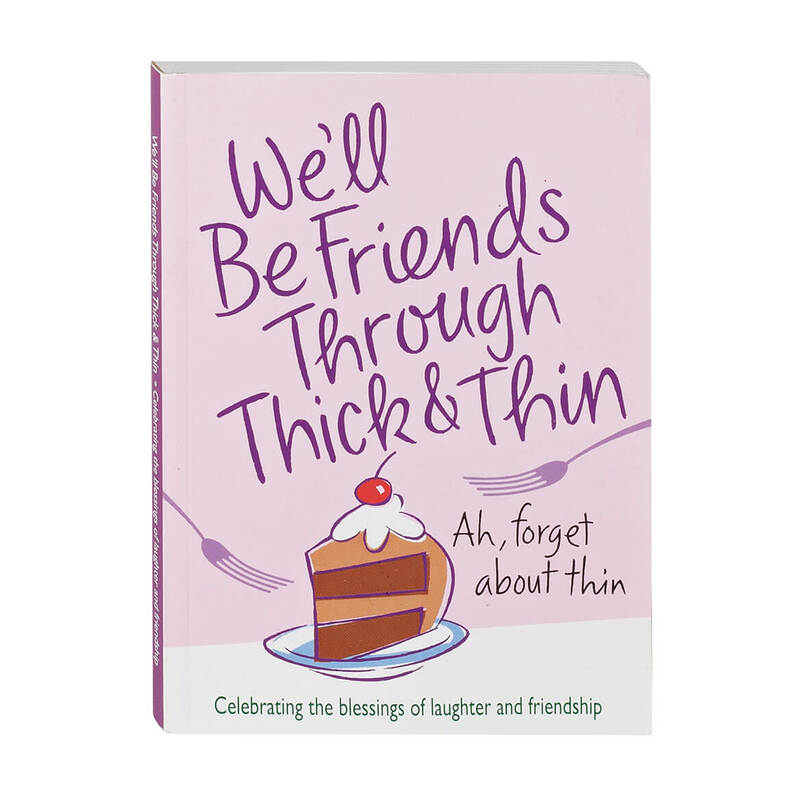 Celebrating the blessings of laughter and friendship, “We’ll Be Friends Through Thick and Thin” affirms what you already know—a true friend is one of God’s best gifts, rivaling chocolate in many ways! Brimming with short stories, sayings and quips about friendship inspired by faith, this inspirational book explores all the reasons we cherish our friends so much. Enjoy its wit and wisdom, cover to cover, or share it with the special friends who are always there for you. Softcover friendship book, 144 pages. 6 3/4″ long x 4 3/4″ wide. Yes, you can keep on top of your bills. 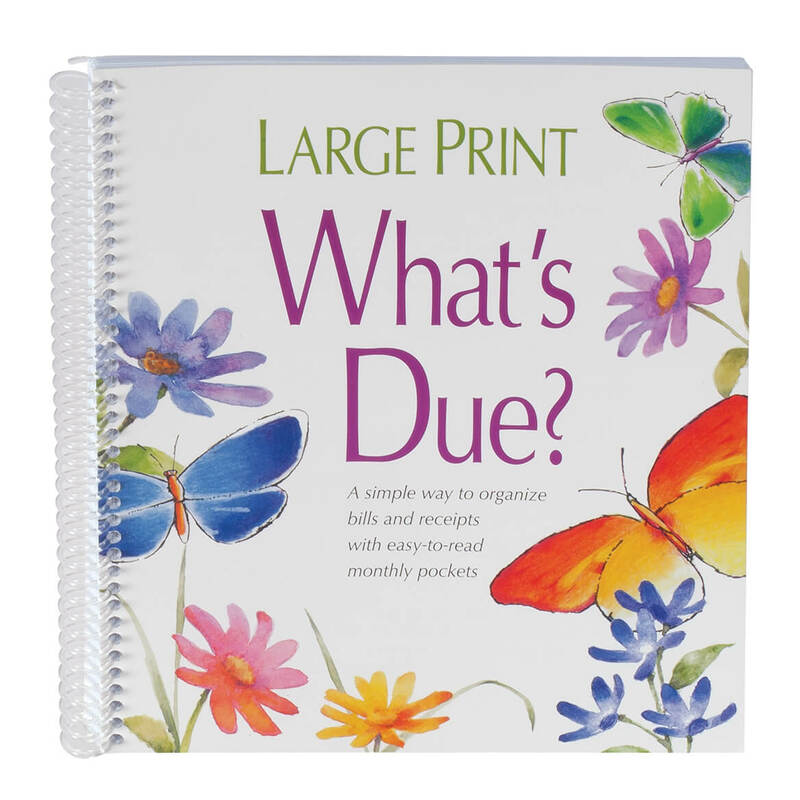 When they arrive, just insert them in the slot for their due date in this handy What’s Due bill organizer book. On payment day, note the date and keep the receipt in the slot of this bill paying organizer. That’s it – your bills will be paid on time, and at tax time, you’ll have all your receipts. Spiralbound monthy bill organizer. 8″ wide x 10″ high. Thoughtful, inspiring and practical … the “When Someone You Love No Longer Remembers” book provides sanctuary for those who journey alongside a loved one whose memory is fading. 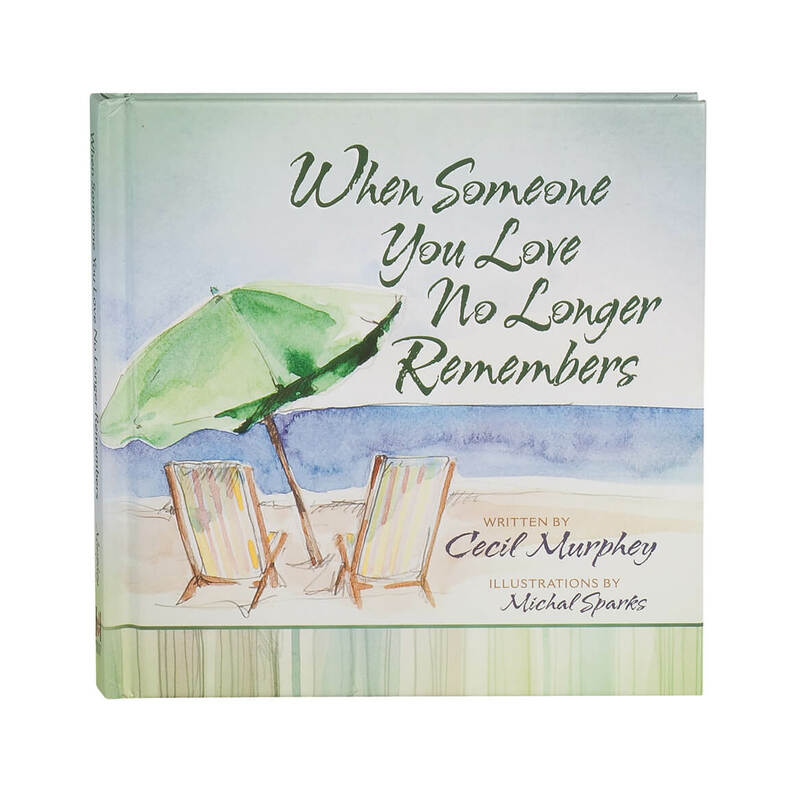 Bestselling author Cecil Murphey’s caring words and spirit provide comfort and prayers for family members and friends, along with tested advice and encouragement for caregivers. Enhanced with tranquil paintings by artist Michal Sparks, Murphey offers invaluable guidance in this dementia book on how to seek assistance, take care of yourself, communicate with and help others connect with your loved one, and introduce activities and exercise to enhance health and mobility. It’s a gift that goes beyond mere words—offering strength for the heart and hope for the spirit. Hardcover, 64 pages. 6 1/3″ x 6 1/3″. Chronicling the birth, growing pains and coming of age, right up to modern day America, “The Story of America in Cartoons”‘s brilliant images encapsulate complex ideas through the eyes of great cartoonists like Thomas Nast, Joseph Keppler, W.A. Rogers, D. R. Fitzpatrick, Bill Mauldin and more. 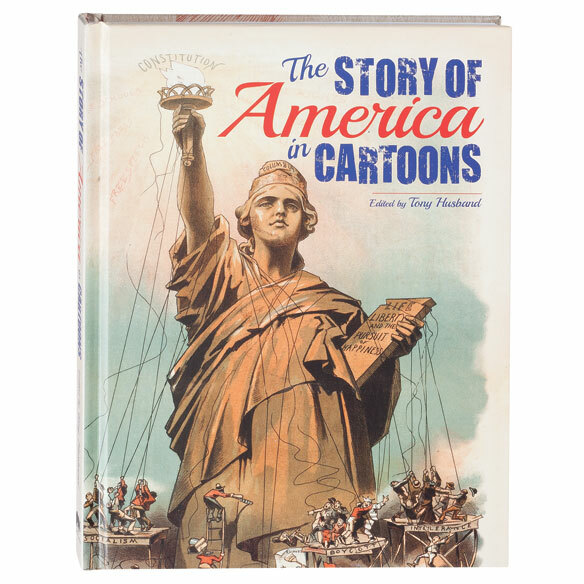 Offering a no-holds barred glimpse of the U.S. from early days to present political free-for-all, it features more than 230 political cartoons—serving up American history in hilarious style! Hardcover, 192 pages. 7 1/2″ wide x 10 1/4” high. With 8 books in this Word Search Spectacular set, your search for puzzle fun ends here! Each word puzzle book includes classic word search grids with complete answer keys, hundreds of words and terms to find—and fun, inventive themes to keep each challenge fresh! 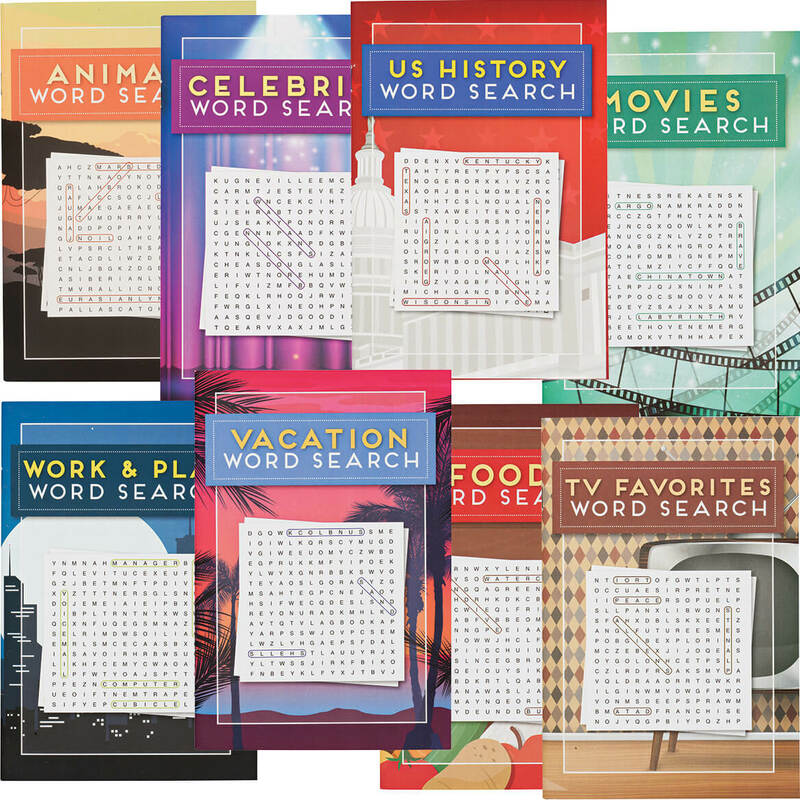 Conveniently sized to carry along in your purse or glovebox, the set of 8 word find books includes: Celebrities, TV Favorites, Movies, Foods, Vacation, Work & Play, U.S. History and Animals. Each softcover, 32 pages. 5 1/4″ x 7 3/4″. 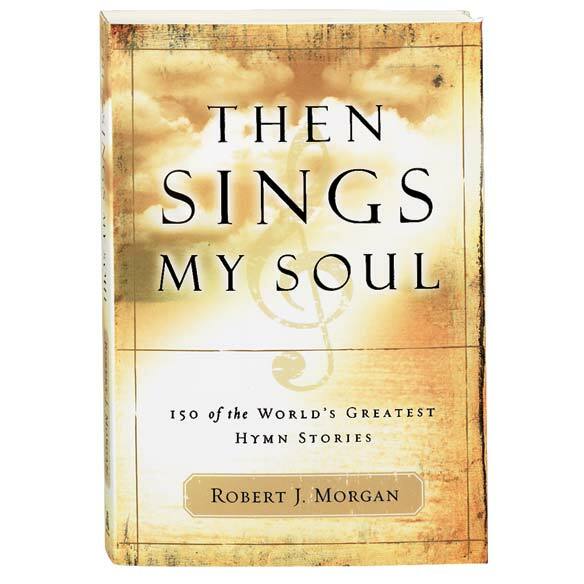 Then Sings My Soul Book will reacquaint you with 150 beloved old hymns and the stories behind them. This hymn book of inspirational treasures feature devotional style accounts and history, many reflecting the hymn’s impact on ordinary people. Includes complete music and lyrics. Each softcover; 308 vintage-look, ragged-edge pages. 6 1/4″W x 9″H. 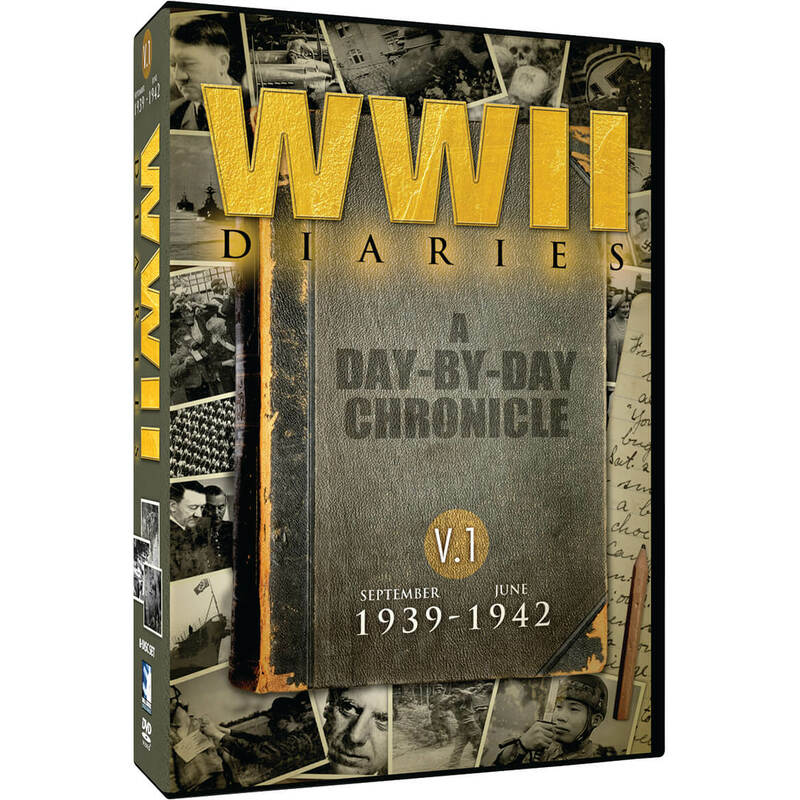 You’ll be mesmerized by this day-by-day chronicle of WWII activities and struggles from September 1939 through June 1942 with the World War II Diaries—Volume 1 DVD set. Each day is represented in 2-minute segments that combine to provide hours of wartime video footage, newsreels, photographs and more. This World War 2 collection includes bonus documentaries from the “Why We Fight” propaganda used to garner support, including Oscar-winning “Prelude to War” and “Nazi Strike.” Nine discs in this World War 2 DVD set run a total of 37 hrs., 13 min.